What to wear to the symphony? Where should I sit? Answers to some of your questions about going to see an orchestra concert. Orchestral concerts are a lot of fun, but for those who have never been, going to see a show can raise a lot of questions. 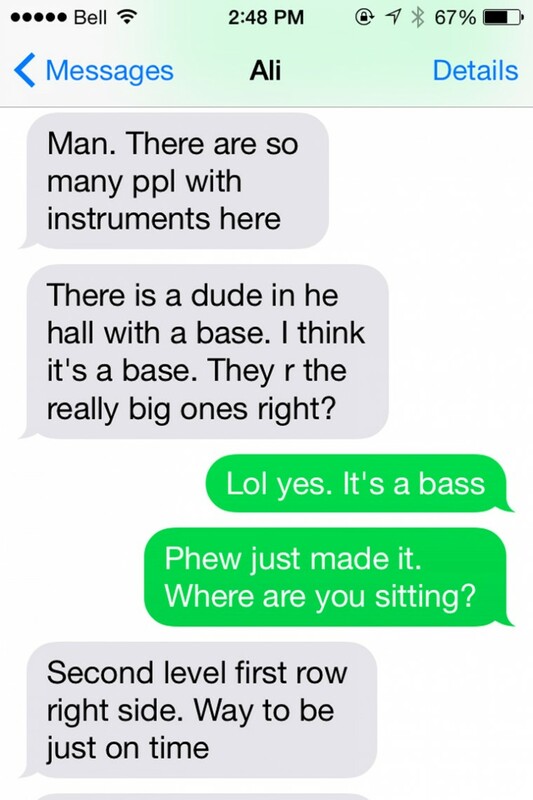 After taking some classical music newbies to see the symphony, a few common queries emerged. Question: What to wear to the symphony? 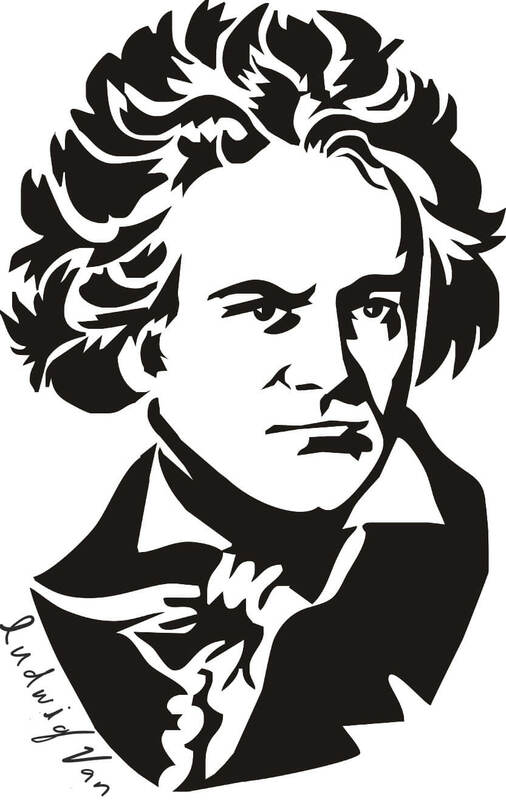 Most classical performances have become fairly accepting of casual dress, but feel free to get as dressed up as you like. Some people like to treat it as a fancy night out on the town and dress to match, but often people come in everyday casual clothes. Some concerts are billed specifically as a more relaxed show, but even at regular performances, no one will check to make sure you’re dressed right. You’ll be sitting down for a pretty long time, so you may as well be comfortable. As a general rule, avoid ripped or dirty clothes, anything overly revealing, or anything that might get in the way of someone else enjoying the performance (such as a meat dress, or a tall hat). On the serious side, most venues ask that you avoid perfumes, colognes, or other scented products. 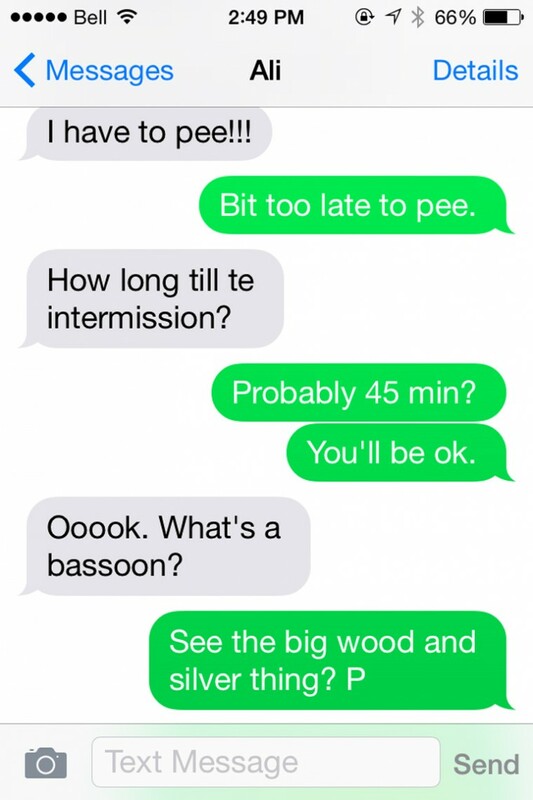 The bassoon is the long wooden instrument sitting next to the oboes and other woodwinds. It’s a double reed instrument, which means that like the oboe, the bassoon is played by blowing through a very small hole in a specially made reed, which then vibrates. The bassoon has a range of Bb1 to Eb5. Sometimes orchestra also calls for contrabassoon, which looks a little bit like two normal bassoons stuck together side by side. It sounds vaguely nasal but when played it well has a beautifully rich and reedy sound. Question: What is that big stick thing with the little pipe coming off of it? Question: Why are all the stringed instruments the same colour? That’s a great question; it’s probably because really high-quality stringed instruments are often really old. The most famous violins, those made by Stradivarius for example, were made in the 1600s, before coloured stain was really a thing. They do actually make instruments that have been stained a rainbow of colours, but they would stand out as newly made instruments in the context of a string section, and are generally not of the same calibre. A really well-made instrument will have a sound that speaks for itself and wacky colours could just be distracting. When orchestras perform they aim for unity, both in their sound and appearance (that’s why they all wear the same thing too!). That said, soloists in the brass world (notably Jens Lindeman on trumpet) occasionally play on novelty instruments with coloured lacquer, so aside from the argument that the best sounding instruments are usually not manufactured with a colour, string soloists don’t have any really good reason to continue solely playing on traditionally stained instruments. Question: why are they all sitting in specific places – who decided who sits where? Generally speaking, the orchestra is arranged with quieter instruments in the front, progressing to louder instruments in the back (that’s why the brass and drums are in the very back). The idea is that the louder sounds carry more easily, so putting them further away balances out the sound of the orchestra. In terms of left to right arrangement, there is actually a fair bit of flexibility and not necessarily a standard format. 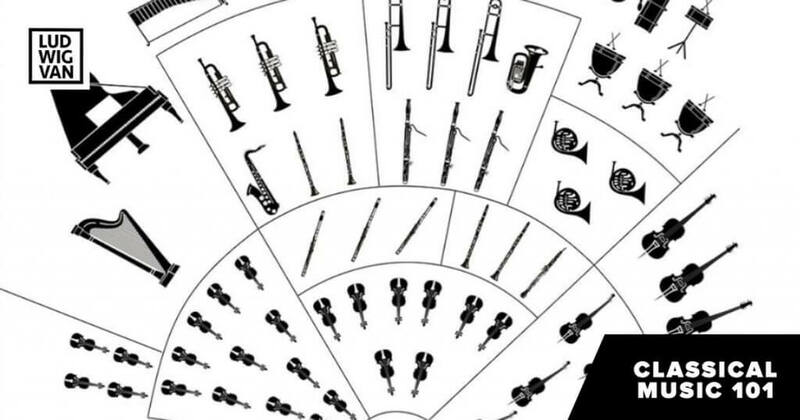 Usually the more melodic instruments are on the left (from the conductor and audience’s viewpoint). Most conductors are right handed, which would make cueing to the left for entrances easier than cueing to the right. Try it yourself: if you are standing in the centre of a clock – point to a number between 9 o’clock and 1 o’clock. It’s pretty easy right? Now point to 2 or 3 o’clock, it becomes a little bit more awkward. Ultimately, the conductor decides. They may take many factors into account including the acoustics of the hall and the music itself. Michela Comparey reluctantly picked up the tuba at age 13. Thanks to competition with her brother who also played the tuba, she stuck with it and has since earned a Masters in Tuba Performance and Pedagogy from Memorial University. Her musical career so far has included playing with numerous ensembles including the Newfoundland Symphony Orchestra, the Royal Canadian Artillery Band (among others in the Canadian Forces), the Weston Silver Band, and several chamber groups.She is a co-founder of Euba, a professional tuba-euphonium quartet.